This summer, work will begin on the country’s first true high-speed rail project— California High Speed Rail. The first line of tracks will be put down in the Central Valley, stretching roughly 114 miles from Fresno to Bakersfield. Eventually, the line will connect Los Angeles and San Diego with the Bay Area and Sacramento. While Stockton won’t be included in the rail’s network for sometime– extensions to Sacramento are not included in the project’s first phase– It’s not too early to discuss the benefits that the eventual high-speed line will bring to smaller cities in the Central Valley. The opportunities for growth provided by integration into the state’s high-speed rail network are great, according to researchers. Recently, the Proceedings of the National Academy of Sciences published a study concluding that high-speed trains “facilitate market integration and mitigate the cost of megacity growth.” In layman’s terms, as the Atlantic Cities puts it, “high-speed rail boosts life in satellite cities while relieving pressure in major ones.” While this research was conducted on China’s bullet train corridors, the study’s authors see wide ranging implications for smaller cities along California’s planned high-speed rail route. Khan and his team found that high-speed lines boost real estate values and increase the quality of life in cities within a reasonable distance of a large metro area. 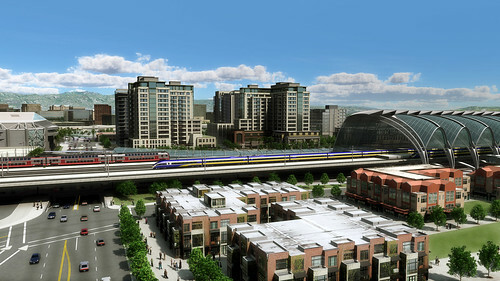 They conclude that high-speed rail helps alleviate congestion and high living costs by encouraging residents to live in so-called “second-tier cities,” which then reap the benefits of increased population and easier commuting. While these findings are encouraging, keep in mind that this study was conducted in China, meaning that California cities may not experience these benefits on the same scale. However, the characteristics of the satellite cities in China seem to mirror conditions in the Central Valley. The authors explain that the most positively affected second-tier cities are located within 100 miles of the larger metro area and are situated along fairly dense corridors where conventional transportation options—airports and highways— are at capacity. These characteristics ring true in Stockton, sitting about 80 miles from San Francisco. Further, population in the Central Valley is slated to grow faster than the rest of the state, meaning the region can facilitate the extra growth researchers anticipate from high-speed rail. Finally, traffic into and out of the Bay Area is among the nation’s worst, and regional flights to the Bay are not readily available from the region. These traits indicate that Stockton is ideally situated for a high-speed rail connection. 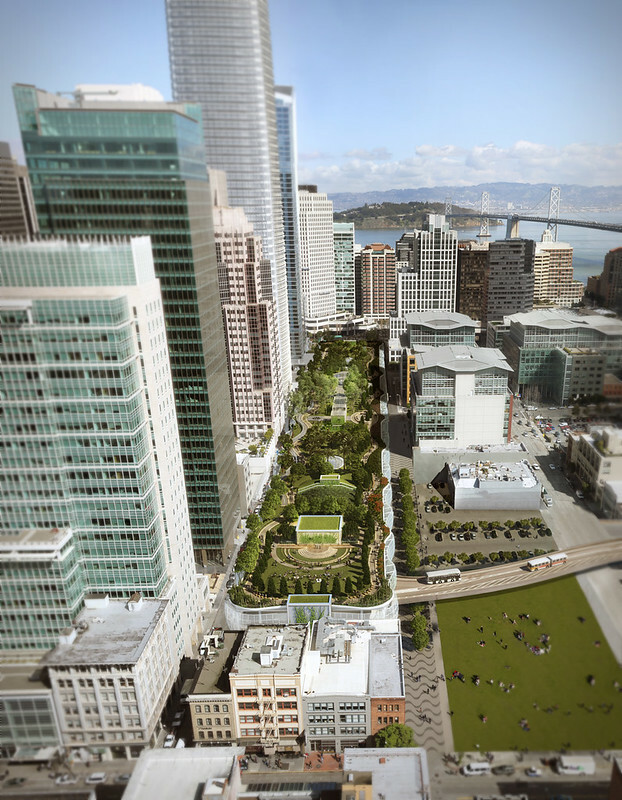 In the past, the region has similarly benefited from an influx of Bay Area transplants taking advantage of lower costs of living. Though high-speed rail will undoubtedly spur similar growth, the effect on the city’s development patterns may be very different. 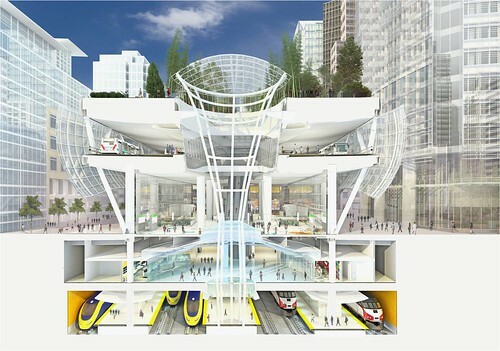 Because growth will be facilitated by the rail line, development would be centered around transportation hubs—such as Downtown’s Cabral Station. Unlike before, sprawling houses and office parks would become less attractive, as driving 20 minutes to a train station defeats the purpose of moving to an area that is connected by rail. Instead, cities along the corridor should expect increased demand for housing and commercial within close proximity of transit hubs. Officials at Cabral Station understand the opportunities presented by high-speed rail and have plans for Transit-Oriented Development in the surrounding neighborhood (which is also why they are such big partners in the Miner Avenue Streetscape Project). While some question the viability of high-speed rail in California and issues continue to crop up with its construction, it is clear that demand for rail is increasing, even here in the car-centric Central Valley. As I have noted before, Amtrak’s San Joaquin Corridor service continues to see a rise in ridership numbers, checking in as the nation’s fifth busiest Amtrak line with just under 1 million passengers in 2012. Stockton’s two stations—Cabral and San Joaquin Street stations—combine to make the city the 13th busiest stop in the state (I don’t believe these stats include ACE ridership, either). As road congestion increases and airfare becomes prohibitively expensive, demand for quality rail service will skyrocket. As my Amtrak RR engineer friend said, if the gov was interested in true Calif HSR and increasing passenger rail traffic in the state, the first leg of HSR would have been LA to Bakersfield, that would connect with existing Amtrak rail service. That way, there would be immediate, integrated benefit that would increase passenger rail traffic. That option was not selected, and instead we have HSR “to no where.” This is a public works project, and a profoundly inefficient one. Economic resources devoted to projects like HSR could be used for more sensible, direct and nobler public purposes. The economic cost will stop the completion of HSR, so it will be a horrific waste. Starting the line in the Central Valley is not the best choice for the reasons you mentioned, but the decision to start the line in the Central Valley was made in part because of the region’s disproportionately high unemployment and poverty rates. The thinking was that this area needed jobs the most, and starting out in the valley would provide jobs in areas of highest need. As for the “HSR to nowhere,” it should be noted that the federal highway system began much in the same fashion, with the first projects located in rural states such as Kansas and Nebraska. Obviously, these networks were eventually completed. Economic Report of the President 2010, page 246, $90 billion spent to create, by gov definition, 720k new jobs = 125k per job. I suspect the cost per job is far, far worse for HSR. That is the problem with public works to create jobs. The HSR will operate at terrible losses, thereby consuming more and more resources. Folks need to consider the numbers. David, you have existing rail service to Bakersfield – it is pure madness not to connect to that existing service as the first priority vs dup rail lines. 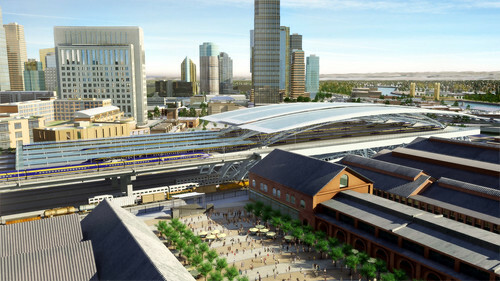 And consider if the entire HSR is not built, it would be better to have at least that rail connection: LA to Bakerfield, with tsf at the same station Bakerfield (via Amtrak) to Sacramento, Stockton, SF Area, Portland etc. I agree, it would have been more prudent to start a line in SF or LA that can connect with Amtrak service in the valley, but the decision has been made. My point was more about the benefits to the cities themselves, the handling of the rail system itself up to this point could certainly be improved. Started in the valley because that’s where the jobs are needed the most? What a ridiculous notion! They’re starting there because it’s the path of least resistance and the cheapest place to start. Don’t worry that it will be a USELESS stretch of rail. Who needs to get from Fresno to Bakersfield in 30 minutes? Connect Bakersfield with Los Angeles or don’t bother to build ANY of the HSR! “Train to Nowhere” is right! I think this is a great idea, personally. It offers a wider pool of jobs for a lot of people, and more efficient and reliable transportation to get there. Maybe it would have been better suited starting from L.A. to Bakersfield, but the Central Valley has nothing of the sort where Bakersfield/L.A. already do. I’m in full support of this project. If you are concerned about SJV job creation, then think about how those gov controlled economic resources can best (or better) be used. An expensive, inefficient project like HSR that will continue to generate losses until abandoned, is not the way to help folks who need jobs, rise above poverty, or improve their individual skills and education. We need to think more critically about these projects, and consider the best uses of gov funds. There are certainly other ways to stimulate the economy, but this is not a question of choosing one policy over another. The initial round of funding for rail was approved by voters statewide, and federal money allocated to the state is specifically earmarked for high speed rail. Its not a question of taking money from one endeavor and transferring to another. In approving the HSR bonds, I believe Calif voters were mislead by many representations that are highly unlikely or clearly untrue. David, you write in praise of HSR, affirming the unfortunate decision of the voters, and then use the vote as a justification for HSR. The first step is to see it was a mistake. Do not use a mistake to justify a project that is otherwise folly. We should reflect on (1) the economic reality of HSR, and consider (2) alternatives we face. The CA bonds are authorized but do not have to be issued and the funds do not have to be spent. If the bond funds are not spent, you will save Calif taxpayers money, and that frees up resources for the taxpayers to spend individually, or increases the ability to raise taxes with funds used for better public purposes. David, I had read about this exciting news of China’s HSR analysis, and it does look extremely optimistic and promising in terms of satellite cities becoming convenient and strategic extensions, or pipelines, to metro cores within 100 miles; so obviously Stockton under 100-mile proximity to SF/SJ, and Bakersfield in 112-mile proximity to LA will be the two cities that will most benefit from the HSR, in my analysis. Overall, if schedules, accountability and the audits are conducted properly, we’ll have a fully functional intrastate rapid transit system operating by 2020 (in 6 swift years), and we’ll begin to see its profound economic benefits in ways people today cannot even imagine. Merely look at the quantum leap the U.S. underwent after the launch of Eisenhower’s interstate system that made Route-66 obsolete and generated a new chapter of flourishing growth and innovations. But also in my analysis, this will be doubly good for Stockton as it is poised to enter the Knowledge Economy, due to the integrated CHSRA’s strategy of the Altamont Corridor Rail Service connecting Stockton strategically to San Jose because this means Stockton can gear up to become a high-tech satellite of Silicon Valley if it cleverly and timely develops strategic public policies, design initiatives and economic plans to zone and construct a viable tech city within a city via an exclusive mixed-use “High-Tech Cluster” district or sector, like Boise and Portland have done, or Boston’s “Innovation District” has planned and is creating. This is the next wave for American cities and their economies currently undergoing transition from the Information Age, because developing IPs and knowledge assets (KAs) comprise the new emergent economy that will be a must for municipal survival, which is why San Jose has literally been unscathed by the economic crisis of the past 5 years. Thus, the interconnection of stockton to SJ and the IT industries and institutes, i.e. Stanford University or software companies like Adobe Systems, which might establish IT research satellites in Stockton, can spill over into Stockton as a “High-Tech Satellite” and the community can benefit from the accompanying accouterments of new younger hip tech-savvy and literate residences, the IT-Urbanites, with higher education, higher disposable income, having attributes of a philanthropic nature, dutiful and community oriented, innovators, culturally enlightened; while simultaneously the effects of trickle down economics supports expansion of service industries, the arts, music and culture, new museums/galleries, leisure and recreation, and broadens the city tax revenue base for city services, i.e. police protection and fire/emergency services resulting in reduced crime levels, and improved schools and parks. 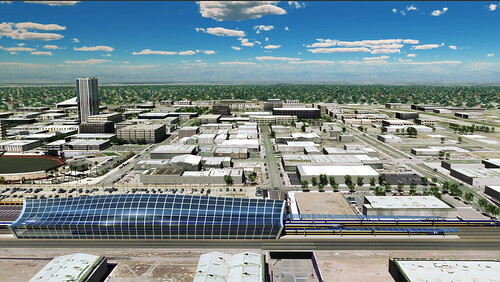 I really think the HSR will quantum leap Stockton into a new growth cycle of economic prosperity, if it strategically and swiftly mobilizes now to align itself with the connective high-tech opportunities of Silicon Valley that the HSR will deliver to its threshold. Hopefully, the key people and instrumental movers and shakers of Stockton will open their eyes to this and strategize the possibilities. 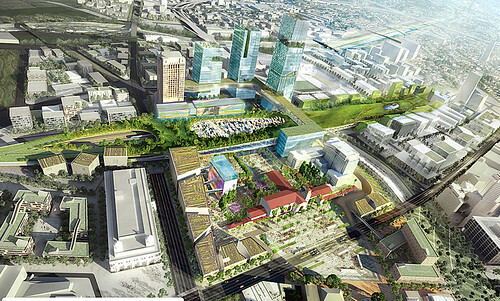 Frankly, I’d recommend de-industrializing the entire district south of the 4 Cross-Town Frwy that is flanked by the I-5 in the west, Aurora on the east and Worth on the south and develop it into a rezoned “Technopolis” with lifestyle amenities specifically geared towards the IT-Urbanites’ targeted demographic profile. Research indicates culturally rich and cultivated urban lifestyle living is their preference, rather than suburbia living; so an urban high-tech cluster environment would be highly appealing to this demographic group. I’d turn the Mormon Slough into a major central urban cascade park with a central canal with a bike trail to the Channel, having reading gardens, strolling esplanades, café terraces, jogging trails, pedestrian bridges, art plazas, fountains, sculptures, and an amphitheater, and I’d situate mid-to-high density living complexes around this corridor. The district would need to feature a major international technoforum and world tech center, as well as IP copyright law center and research library, a high-tech resource, service and exchange centrum, institute facilities, research labs perhaps with emphasis on technologies to quantum leap San Joaquin County’s agribusiness into the 21st century, hydro-tech research and peripheral industries in agritech, green tech and reusable energy, bioengineering, nanotechnology, and biogenetic and biohelix research. Amenities should include executive towers, executive gym (Bally’s), commerce and banking plazas, and an up-scaled urban fashion center with high-end retail stores like Saks Fifth Avenue, Bloomingdale’s, Neiman Marcus, and Nordstrom… with restaurants, nightclubs, theaters and hotels. And I would certainly recommend creating an exquisite Filipino-American Cultural Arts Center (Little Manila) along Lafayette and Sonora to preserve (what little remains of) this aspect of Stockton’s cultural heritage with a spectacular theater, art and historical museums, hotel, gardens, art-crafts bazaar and marketplace (think tourism dollars). Anyway, these are merely some ideas to kick around. These are some great insights, and I agree the area between hwy 4 and Mormon Slough could facilitate some great projects in the future (though getting water flowing through the slough would be a huge challenge). More importantly, if Stockton is to enter the tech age, as you mention, there needs to be neighborhoods and communities that can support the types of people who work in these knowledge-based industries. Most of these individuals prefer more walkable neighborhoods rather than large, car dependent single lot communities. This is something I will probably write about in the near future: that attracting knowledge-based businesses has more to do with making the city desirable than it does with tax breaks. Yes, this particular demographic group is young and urban-oriented. In articles I’ve read regarding Portland and Boise’s high-tech clusters, the IT-Urbanites raved about the ideal mix and conditions of working in high rises with accommodations for dining, services, entertainment and shopping on the street level and living within walking distance. It was not merely the convenience that was appealing, but the exciting cosmopolitan dynamics, synergy and mix of vibrant culture and things to engage in, community interactivity, having the feeling that you are apart of a renaissance. Below are the HRS terminals these other cities have on the drawing board… and are already in design review… What about Stockton? STOCKTON HSR TERMINAL: ??????????? So my question is… where is the design??? It needs to be comparable to Fresno, at the very least, if not equal to it. But Stockton’s terminal has the double duty of servicing the Sacramento to Merced HSR line as well as the Altamont Corridor HSR line to San Jose and the Bay Area. In my analysis, this makes it a far more noteworthy priority needing a substantial and significant design. Why has Stockton not even been on the radar map with this critical design issue to create a signature station that can be a pièce de résistance for a major welcoming city threshold, an “EAST GATEWAY” to the city, and a major hub-anchor for a new focal point development of amenities and cross-supportive transportation? For Stockton, I’d recommend creating a major multifaceted transportation hub like the Anaheim ARTIC (on a mid-scale of course). Besides the Sacramento-Merced HSR service it most likely will feature service for the Altamont Corridor service to San Jose. 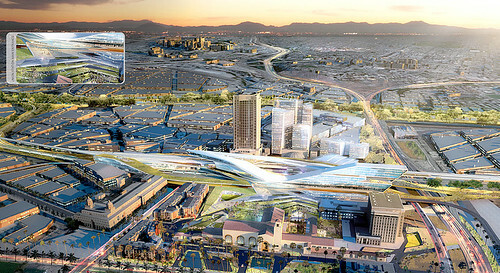 Transportation integration should include the city RTD system, taxi companies and services, and integrate the Grey Hound Bus service (close the downtown decayed GH depot and refurbish that property for something more dynamic, like construction of a regional high-tech mixed-use institute that generates external revenue into the local economy)… I would also integrate into this HSR terminal airport shuttle services, car rental agencies, Hertz, Avis, Enterprise, Thrifty, National, Alamo, Dollar and/or Budget, and feature the trolley downtown/civic transit to the Stockton Waterfront, as well as locate the Stockton Convention and Visitors Bureau on this strategic premise to champion Stockton’s versatile offerings in a very visible and dynamic way to disembarking visitors and commuters via Ad overtures on overhead monitors, instead of located in an isolated out of sight spot on the 2nd floor of an old historic building downtown (out of sight out of mind). This might integrate a “Media Center” featuring announcements and schedules of sports games for the Stockton Ports, Stockton Thunder, current sales at shopping havens and fashion destinations, upcoming festivals, best banks in town, must-sees while in Stockton, local hotel resorts and spas, dining, restaurants and nightlife offerings, and museums, theater, music and art shows, book fairs, and so on. It’s all about “destinations”. A major restaurant courtyard would be necessary as well; and rental locker facilities for out of town travelers. I would call the terminal the “STOCKTON METROCORE”. 1) Central-East Stockton on the ACE-Union Corridor west of Airport Way near Miner and north of Weber. In fact, this entire stretch (7 blocks) from Park to the north and south of Weber to the 4 Cross-Town Frwy at Washington, and between the tracks on the west flank and Union on the east flank should be razed of all industrial blight and developed into an exposition linear park (conjoining with Constitution Park), and featuring the central HSR terminal, museums, historical and memorial monuments (Commodore Robert F. Stockton and Captain Marian Weber come to mind), cultural venues, plazas, fountains, bike/jogging paths, dog park, amphitheater, reading gardens, botanical gardens, aviary, sculpture gardens, public murals, mid to high density mixed-use residential complexes with boutiques, restaurants and services in an “urban village” atmosphere with terraces, seating, kiosks, urban waterfalls and bridges, reflecting ponds, shade canopies, picnic groves, all lushly vegetated with foliage and shade trees. 2) HSR-Metro Airport Superplex combination, where the Stockton Metropolitan Airport is replaced in combination with the HSR terminal, a new incarnation, a superplex transportation and airport terminal hub to facilitate the growth of a regional Aeropolis. 3) The least of the recommendation was to locate the HSR terminal adjacent the San Joaquin County Fairgrounds at Airport Way and MLK Jr Blvd (Charter Way). You have certainly given this a lot of thought! To my knowledge, the high-speed rail stop would be the existing Cabral Station downtown, which I believe would be the most logical spot, though it may cost more. The extra cost would be worth it, because a high speed rail stop would bring tremendous economic benefit to downtown, and the folks running Cabral have plans to revitalize the surrounding area. I imagine that the station itself would need to be expanded to accommodate the increase in passengers. Exactly. 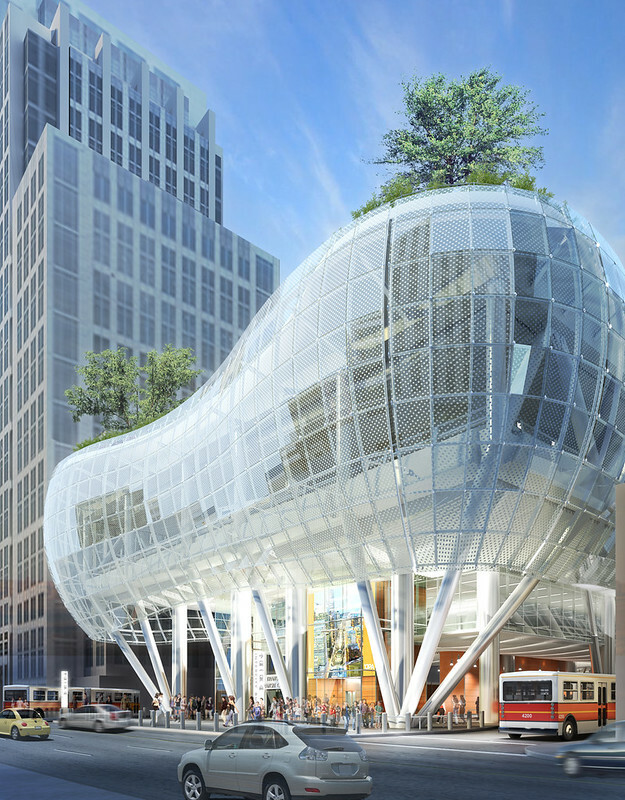 If it is the Cabral Station it will need radical redesign, retrofitted with the HSR accommodations, much like a modern glass expansion to a historic brick masonry structure. But my understanding is the new track for the HSR is separate from the conventional tracks and electrified, which gives it its extra speed; and if you will notice in all the terminal designs the HSR comes into a city elevated on pylons because the whole system is completely insulated from contact with other systems, even isolated from road traffic cross-sections. This is also why there are elevated mezzanine platforms designed into the terminals to disembark the passengers on the HSR level and suspended bridges and escalators over the lower railroad tracks to shepherd passengers to and fro the upper HSR deck and lower street level. In my analysis, the current Cabral Station does not have the projected capacity required for the 2020-2060 commuter load. So it will be interesting to see what they have planned. 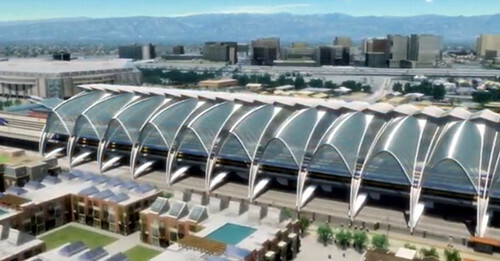 I suspect a new terminal will be designed adjacent Cabral Station, like the San Jose HSR station is in proximity to its older city station, and ramps will be integrated to connect both together for the mutual option of conventional train travel and the HSR travel. 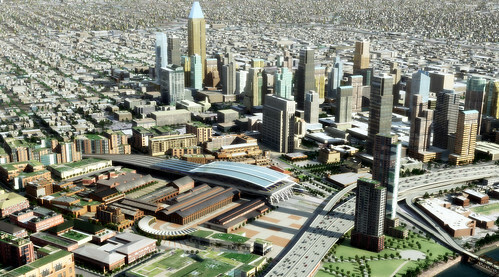 I would locate the new terminal on the east side of the tracks where there is more land availability and integrate the design into Cabral Station on the west side of the tracks, then turn the entire 7-block corridor that parallels the HSR track into a linear park-lifestyle urban community with public amenities and venues. Did you see this? It seems to add more urgency for the HSR. This is very sobering. In the next 17 years, San Joaquin County is projected to increase its population by an additional 40%, and be shy of 1 million residences (about 960,000 population, other projections suggest 975,000). By 2060 (in 47 years), San Joaquin County will easily mushroom to 2 million people. My concern is the growing poverty level in the Central Valley that accompanies these numbers due to imprudent immigration policies; Modesto, Merced, Fresno, and Bakersfield-Delano are among the poorest metros in California and the U.S. It’s great to have a large thriving and robust population, but is it skilled, literate, educated, fluent in English communications, industrious and self-sufficent? Can it make tangible and positive contributions to the collective society in a meaningful way where others mutually benefit, or where quality of life is enhanced? I have written before on the region’s growth rate. It appears the region will be adding residents faster than the rest of the state, which presents both a challenge and an opportunity. The challenge is to adjust our growth patterns to incentivize investment into older neighborhoods, or else the region will look more like Los Angeles. With more residents means more cars, and to the extent that we can provide communities that require fewer or shorter car trips, the better, especially because of the poor quality of our air. Oh, very good; I’ll check it out… Thanks. There is one thing most people have not considered, though, in terms of Earthquake Country California and its population explosion. And I hate to be the one to point this out, but it’s true. Concentrated growth in a confined location vs. diffused growth over a wider region… a catastrophic mega-quake will result in heavier causality for the former where people live on top of each other and infrastructure is condensed, and lesser casualties will result for the latter where people and infrastructure are dispersed over a vast area… just something to, reluctantly, think about. Perhaps self-sufficient limited-growth lattice city design should have been the direction for California. But it’s too late now; the mold has been cast. Of course, you have to realize these population projections for California were BEFORE the passage of unscrupulous Proposition 30, the Robin Hood economic suicidal death-wish that California just unwitting shot itself in the foot that penalizes the creative and genius business innovators, wealth and job creators, California’s Entrepreneurial Gold, who fuel the state’s economic engines creating innovative enterprises, businesses and products, employment, manufacturing, a trickle-down means for a livelihood for the populace in lower income brackets, and a revenue tax base for state coffers; and thus an exodus of this particular targeted group out of the state will be catastrophic and is going to produce some very scary unforeseen consequences… think ‘Detroit’ but on a state level, I ultimately fear. Yes, lots of population may be in California, but unfortunately, the wrong kind, a very impoverished population; and not many funds for urban construction dream projects, i.e. infill redevelopment and shiny new high speed rail trains zooming all over the landscape. I just don’t think California will be able to recover from this blow which is also compounded by the Fed level of new formidable and behemoth taxes, the 320,000 new pages of drastic and draconian business-strangling regulations from the private sector unfriendly White House, and the horrific news from the congressional committee report that cites how Obamacare will quantum leap healthcare premiums by a whopping 204% virtually making healthcare for many Americans completely unaffordable, while the healthcare providers belly up. The mix of these multiple tax onslaughts will create unfathomable consequences and is just pure insanity. It seems that America is going by the way of Bangladesh, a Third World Country but will soon have half built and unused high speed rail infrastructure used to hang out and dry laundry because no one will be able to afford electricity, either. In over 50 years I have never seen anything remotely like this. It’s truly frightening. This is outside the scope of this blog, but I will simply respond by asking this: California has suffered from high taxes and a high cost of living for decades, why hasn’t this mass exodus happened already? Because it never will. California metro areas are the leaders in innovation, and high taxes do not dissuade entrepreneurs in the way you imagine. If your hypothesis is true, then California cities would not be as prominent on the Brookings graphic linked above showing which areas lead the way in patents, which is a true indicator of innovation. In fact, the areas with the highest taxes seem to produce the most patents. Further, you will see low tax areas like Nevada, Arizona, and Texas can’t begin to challenge California. Part of the reason is that entrepreneurs need venture capital for start ups, and all of that money is located in the Bay Area. By the way, the countries with the highest taxes are generally countries with remarkably high standards of living, doesn’t this contradict your assertion that higher taxes in the US will turn us into a third-world country? I recommend reading “The Great Reset” by Richard Florida and “The Triumph of the City” by Edward Glaser. Both do an excellent job showing why cities– with their high taxes and all– are the incubators for growth. Taxes are a small piece of what makes a region economically competitive. Careful David. Capital can move anywhere, and clearly the movement of the financial markets to friendly venues (e.g., London) demonstrates that fact. Many high tax European countries have had to lower taxes to retain talent, and for the most part, while their standards are high, growth is stagnant in much of Europe. They are seeing relative declines vs the faster growing, developing economies. The very high taxes in Calif is a depressing factor in job and economic growth. The economic disincentive is significant relative to other states and some other countries. We need taxes, of course, but we have the highest marginal tax rate 13.9% in the nation (I believe) so that will have an unfortunate effect. Calif benefits now from fixed resources including Cal and Stanford in the SF area, but in the long term, nothing is fixed. The cost of education; the cost of housing; the ability of capital and talented folks to move – will all work to erode high tax, big cities as “the incubators” for growth. Smart people do not pay high relative costs for long periods of time …often they get others to pay those costs for them, but that is another story. Financial markets have been relatively stable throughout history, with London and New York consistently leading the way despite the emergence of Hong Kong and Tokyo as potential economic rivals (again, all of this is found in Florida’s Great Reset book). Europe’s stagnate growth is not due to high taxes, and probably has more to do with weak Eurozone controls. Of course, this is on a global scale, factors are different on a national scale. California has the 3rd highest income taxes and 5th highest taxes per capita. That being said, there simply is little to no evidence that I have seen indicating that cities are losing smart people at any significant rate because taxes are high. If this were true, states with no income taxes would be burgeoning centers of innovation, but most are not. Nevada has no income or corporate tax, but is struggling more than California and as far as I can tell, tech companies from Silicon Valley and Biotech firms from San Diego are not leaving for Nevada. While they play a part, taxes are not ultimately what drives or hinders entrepreneurs. Again, this is all outside of the scope of the blog, and definitely this post. But, it is a really fascinating topic.